It’s my Junior year in Immokalee High School. One more year to go before graduation and begin my career path. I am nervous, but excited for what’s ahead. However; I don’t have a full understanding of this adulthood and going to college. I’m the oldest sibling and will become the first to go to college. I can’t ask my parents because they never got the chance of education. My parents are from Mexico and came here to the United States as teenagers. Working in the hot sun of fields because that’s the only place they were able to work at. Throughout the years, my father is the only one that is still working in the field. I can see the strain it has on his body. He works his hardest to earn just enough for us to get by. He tells us that he does this labor so we don’t have too. He always mentions to us that he want us to do more with our lives and become someone in society. I try my best to help in the household. I had gone to the fields several times to pay bills and for groceries. We finally got a house two years ago and my father was so happy that we have our own property here in the United States. It may had taken him over a decade of work in the fields but he did it. Seeing the struggle and the amount of effort my father puts in to give us a normal life, I’m have my mindset to go to college and help them with all I can so their years left is peaceful. I will be the first one to go to college in my family and I’ll do all the necessary steps to make that become true. My career path I’m heading into is music. From the introduction of band, playing my instrument is my form of getting away from reality. It soothes my mind and keeps me focused in school. Here in Collier County, we have an honor band where students from all the high schools within the county audition in the honor band of Collier. This is my third year in the Collier County Honor Band. I practice constantly to compete against the other people of Collier. I represent the name of Immokalee High School by doing this. Being the only one who makes it into the band from Immokalee. These are the steps I’m taking for my name to be heard and I hope I get sponsored from the career. It’s difficult for me because I’m from Immokalee, like “Oh, he’s from Immokalee.” That’s what I always hear from the students of other schools in Collier. Well music education is my career choice and those that deny me shall get over the idea that I will make it. 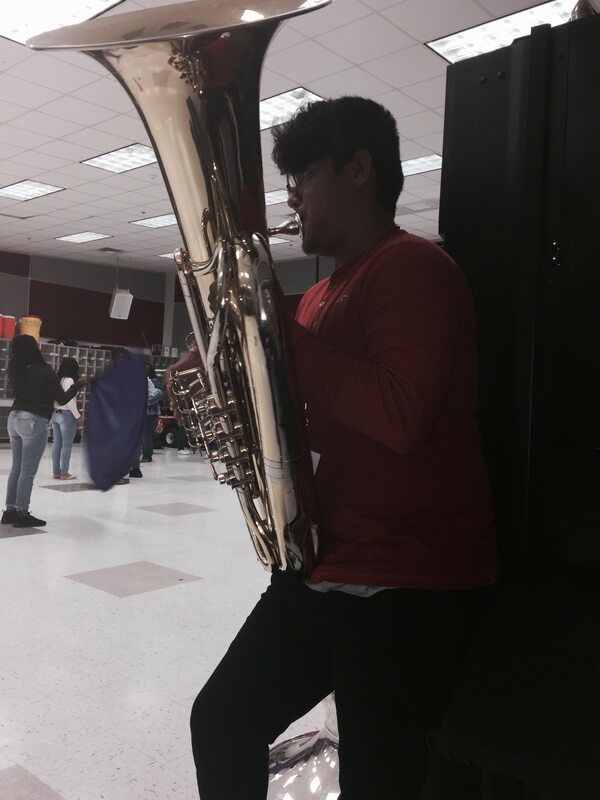 It maybe difficult because I don’t have my own instrument because it’s expensive for my family to purchase, but I have hope that there will be a hand to help me get my instrument, the tuba. Even though the odds are not in my favor because of the financial issues I would have to further my education, I am working and saving up money to make this into a reality. Getting the necessary scores in school and taking the steps to get my name out to the public. So yes, I’m a bit afraid of how it will go, but it won’t stop me from trying to become who I want to be.